Olaus and Mardy Murie home at Murie Ranch Historic District. 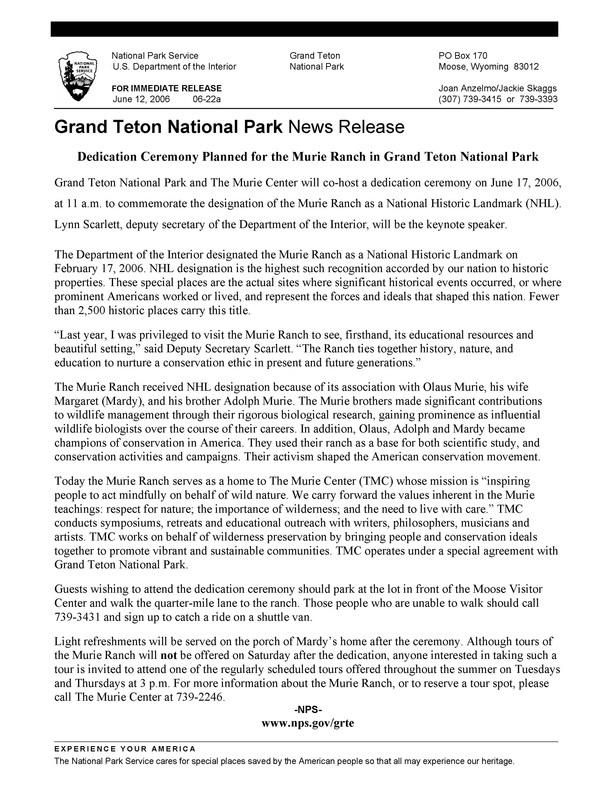 It is possible for visitors to Grand Teton National Park to miss entirely one of the most important places associated with the modern conservation / wilderness movement. Nestled into the trees near Moose, Wyoming is the home of Olaus and Mardy Murie and Adolph and Louisa Murie, and these people helped shape some of the intellectual foundations of natural resource management (often by arguing against prevailing forms of management that intruded human values into natural ecologies) and guided a popular movement in the active preservation of wilderness, especially with their leadership in the Wilderness Society. 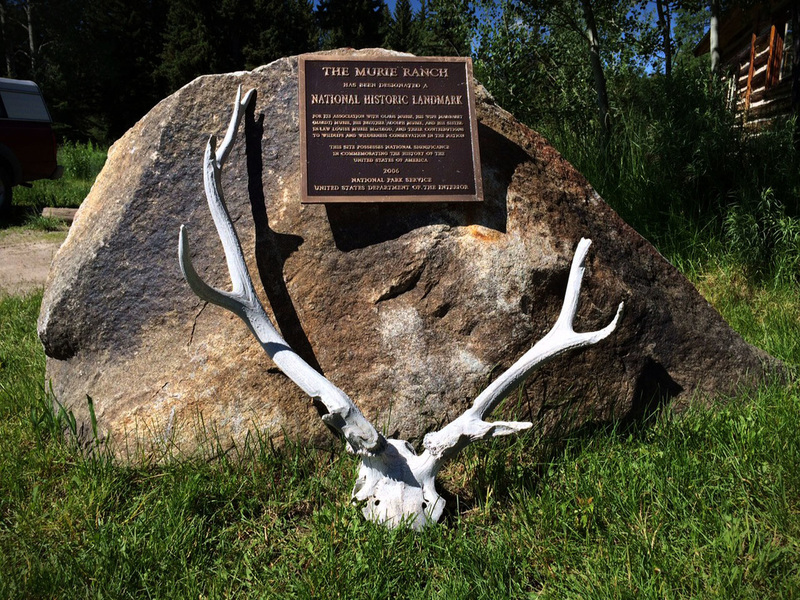 From immediately after World War II until the death of Olaus Murie in 1963, and then after that as others in the family continued on in the cause of preservation and wilderness advocacy, this location proved to be what some called a mecca for the conservation movement. In addition to the homes of the two families (two brothers married two sisters), and the guest and utility buildings and structures of the ranch, which had been a dude ranch prior to their acquiring it, an important feature of the site is the abundant wildlfie. In fact, that was what attracted the Muries to this area. Elk and deer are everywhere, but so are species that had largely been removed from the area in earlier years--wolves and lions--and both are now back so that predators and prey both are evident. 1. Natural Resource Management and Biological Science. The Muries proved nationally significant because of their influence as scientists on policy in resource management agencies, especially, but not limited to, the National Park Service and the Fish and Wildlife Service, as they guided them to a more scientific approach. Their involvement was greatest with the National Park Service and the evolution of policy is most striking in that agency, but it was not alone. The policy gradually shifted away from one that was designed to protect only certain species of animals which, for various cultural and economic reasons, were deemed to be more valuable and beneficial, or at least more attractive to tourists, and to extirpate other species such as predators which fed upon the preferred, “beneficial” species, and shifted to a policy that was more sensitive to all the fauna as equally valuable. The key formulation in this, which is intimately associated with the scientific research of both Olaus and Adolph Murie, is that of an ecological approach which considers all the organisms in a biotic community to be important for their interaction with each other. This perception led both Olaus and Adolph Murie to press the different agencies for minimizing (or reversing) human intervention in the public lands and to allow as much as possible nature to be self-regulating. This also involved, by implication, an enlarged role of natural science professionals in policy formulation in those agencies. In addition, these scientists left their mark on the understanding of science through significant studies of species like elk, wolves, coyotes, and grizzly bears. Not only were these studies undertaken in the framework of ecology, so that their subjects were considered as part of their environment and not studied in isolation from that context, but often their studies were the first serious examinations of such species, and in that they left a legacy of important baseline studies that continue to guide mammalian research at the beginning of the twenty-first century. Finally, their significance can be seen in their effort to communicate their findings to a broad public audience rather than restrict the discourse to other scientists and resource managers. 2. Conservation. The activities of the Muries also demonstrate the rise and evolution of a strain of the conservation movement that saw nature in terms other than as a resource to be developed and a commodity to be marketed, and which found in nature values capable of elevating the human spirit and restoring a sense of purpose often missing in modern urban society. At the end of World War II, Olaus Murie became director of The Wilderness Society, and in that capacity changed the course of the organization so that in addition to seeking the preservation of lands that were undisturbed by modern development, the group also began to seek protection of places beyond wilderness where contact with nature could be retained in smaller ways. In doing so, and as part of a broader trend in the nation, the conservation movement gained in size and strength and after such pivotal engagements like that of preventing a dam from being constructed inside Dinosaur National Monument, the movement shifted from its defense of threatened sanctuaries to shaping policy so that those crises would not define the conservation agenda. This led to the pressure for a Wilderness Act, ultimately enacted in 1964, and the creation of a wildlife range in Alaska in 1960 and the even stronger legislation in 1980 that created the Arctic National Wildlife Refuge and expanded the wilderness holdings in that state administered by several public agencies. In the course of this evolution, the conservation movement changed, and even became the modern environmental movement, and the role that Olaus Murie had performed was continued by his widow Margaret, or Mardy, who likewise left her mark on modern conservation. As the conservation movement transformed into the environmental movement, it was increasingly Mardy Murie who personified the cause, with her distinct ability to articulate complex issues in human terms and to gain the respect of adversaries, all the while pressing forward the ideas, values, and goals that had been identified with the Murie family over six decades. It is difficult to overstate the importance of Adolph and Olaus Murie in the field of biological science and natural resource management. When they embarked on their careers with the federal government, science was used, if at all, to justify programs and policies that had their origins in culture or economics and that imposed on nature a set of priorities and values that were anything but scientific in their origin and formulation. Through intellectual rigor, through sustained and intensive effort, through years of determination, and through resolute acts of courage, these two brothers pressed the government, first, to consider nature as a complex of subtle relationships, each species dependent upon others directly or indirectly, and, second, to implement policies consistent with such an ecological perspective. While the intellectual achievement of helping others to see nature through different eyes would be impressive by itself, it is especially the translation of their insight and perception into policy that adds real-world significance to their endeavors. Because of their work, long traditions and entrenched programs that approached nature as a garden to be harvested or artificially cultivated ground slowly to a halt in the national parks and wildlife refuges and new objectives and policies replaced them to help restore the wilds to their natural health and balance. In the study of different species and their roles in the ecosystems they inhabited, and in the understanding of the intimate, dependent, relationships of predators and prey, both Murie brothers brought new light to bear on wildlife and challenged prevailing orthodoxies about its management. Moreover, eminent and thorough field researchers who spent countless days and nights in the field with their subjects, they were equally at home wrestling with the administrative structures of government service where policy formation took place. Often frustrated, frequently alone, and sometimes threatened, they persevered, they saw results, and they were recognized by their peers for their contributions and more scientists and public agencies came to agree with them. But there was more even. In addition to the intellectual discourse at the highest levels, they mentored countless other specialists and generalists and they also took their science beyond discussions with other experts and infused ecological concepts in the popular discussion of nature and natural resources. As a result, the field of study in which the Muries worked still ripples from the waves they set in motion in the twentieth century. 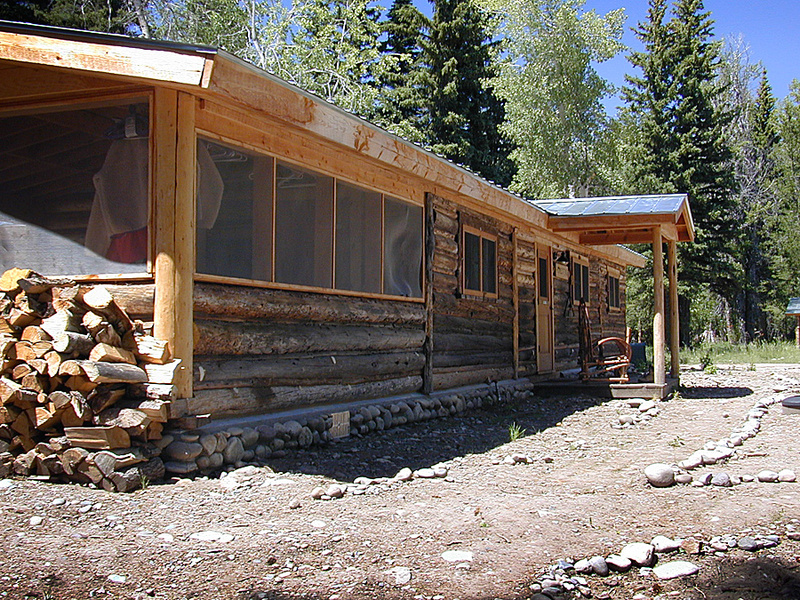 In developing a scientific approach that included complex biotic systems, in pressing for changes in the management of resources to reflect such an approach, in conducting field research that is still a standard referent, and in educating the public to ecological concepts and their policy implications, the Muries at the ranch near Moose, Wyoming, made an enduring mark. In 1953 Olaus Murie argued in a famous essay that wilderness was a national asset, not as a commodity to be bartered, but as a place where people could regain a natural sense of dignity, harmony, tranquility, and individuality. That philosophy guided his actions as a conservationist as he believed that in close contact with nature, the human community thrives and ethnic, economic, and other barriers erode. Close to nature, he believed, people nurture simple virtues and understand money as a means, not as the end. Wilderness thereby permitted not only the wildlife to find a home, but the human spirit to be at peace as well, and nature represented to Olaus Murie the essence of what others would call quality of life. Murie would be significant for his articulation of this view of nature alone, but he did more. With his brother Adolph and his wife Mardy literally at his side, as director of The Wilderness Society, he helped shape public policy so that nature and wilderness became a national priority with legislative protections, and he also helped transform the conservation movement itself so that it gained the initiative in defining goals for the nation and so that it broadened into a national awareness of the fragility of the environment humans inhabit. Taking the orientation of their science—an ecological perspective that emphasized the intricate and interdependent relationships of all living creatures—to the next step, the Muries moved into the public forum and mobilized a political force that had previously too often held a limited vision under a weak leadership. The Wilderness Society became a guiding force, respected not only by its rival organizations in the cause of conservation but also by Congress and presidents. Taking on seemingly impossible goals of protecting from destruction areas that were threatened even though they were already supposed to be preserved, like the San Gorgonio Primitive Area when its boundaries were about to be altered and Echo Park when the Bureau of Reclamation proposed building a dam within Dinosaur National Monument, the organization under Olaus Murie’s leadership achieved remarkable tangible results early on. From there the movement gained strength and momentum and pushed for setting aside more parcels of public land as wilderness with victory coming at first in the Eisenhower administration with the creation of the Arctic National Wildlife Range, and then the passage of the Wilderness Act in 1964 that gave legislative protection to such areas, and then, especially following the guidance of Mardy Murie, the enactment in 1980 of the Alaska National Interest Lands Conservation Act. Along the way, these modest people living at the Murie Ranch at Moose, Wyoming earned virtually every major conservation award and recognition in North America (and often beyond, too), were recognized by their peers and the public for their contributions, and came to symbolize the movement they spoke for. As Stephen Fox notes of Olaus Murie in his standard history of the conservation movement, “As a symbol and spokesman he was invaluable to the wilderness cause.” Likewise, when Mardy Murie was called in her later years the “Grandmother of the Conservation Movement,” that suggests that she was not only recognized and honored in her own right as a spokesperson for conservation, but as a symbol of the movement too. Finally, the one place that in turn symbolized the Muries, and their association with the conservation movement, was the Murie Ranch at Moose—the place where the Muries found their own solace with nature and where countless others equally imbued with the spirit of conservation made their own pilgrimages for inspiration, insight, and strategic formulation for advancing the cause of conservation in public policy. 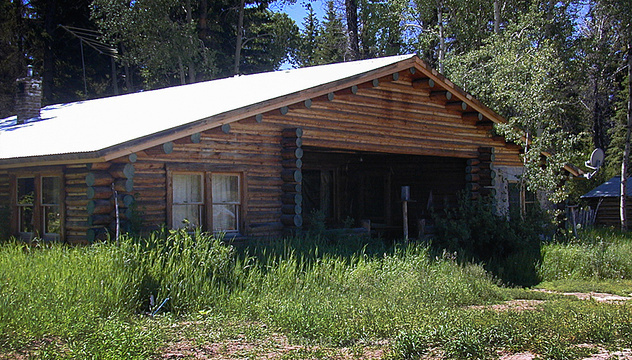 Estes Original Homestead Cabin, part of the Murie Ranch Historic District. As seen here, the building has been repaired and rehabilitated.